This icon is part of a 1497 Russian icon (with P82 and P83) of the prophets from Dormition Church, St. Cyril of Belozersk Monastery. 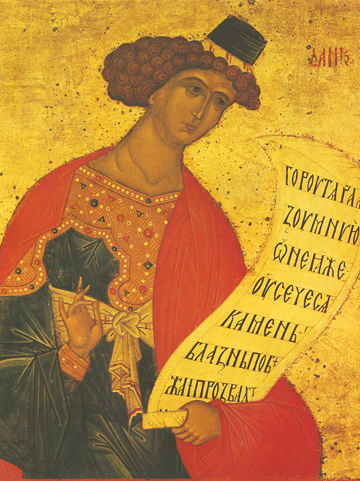 The Prophet Daniel is shown here beardless, which is rendered in iconographic tradition as depicting youth in men. He lived about 500 b.c. and was a part of the people made captive by King Nebuchadnezzar when Israel was forcibly brought into Babylon. Daniel later correctly interpreted a dream of the king, and was then rewarded to live as a prince in the king’s house. When afterwards King Nebuchadnezzar set up a golden idol of himself over 90 feet tall, and demanded that all in his kingdom fall down and worship it on a certain day, the Prophet Daniel and the Three Holy Children did not follow this impious command, nor did they fall into idolatry. Thrown in a lion’s den for this by the king, Daniel was not hurt in the least, and was even fed by the Prophet Habbakuk whom God had sent by an angel to bring Daniel fresh food in the den. The lions even tamely licked Daniel’s feet. Tradition teaches us that the Prophet Daniel and the Three Holy Children appeared to many at the time of Christ’s Resurrection.